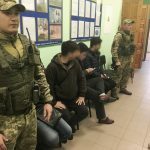 The operational staff of the Southern Regional Department of State Border Guard Service with the involvement of special forces of the Odessa Border Detachment, together with the representatives of the SSU, National Police and other authorities in Odessa region carried out the activities on identification the cases of illegal stay of the foreigners on the territory of Ukraine. As a result of the joint actions, the law enforcement officers detained 10 foreign citizens from different countries of migration risk, in particular Vietnam, China, Afghanistan and Uzbekistan. The violators were in one of the industrial markets of the city. Detained citizens are brought to responsibility under Part 1 Article 203 of the Administrative Code, also a decision was made to forcibly return 5 citizens to the country of origin. It will be noted that the border guards of the Odessa Detachment together with other law enforcement authorities within two months revealed and made responsible 75 citizens, natives of the different countries of migration risk, in particular Vietnam, China, Syria, Nigeria, Cameroon, Senegal, Côte d’Ivoire, Azerbaijan and Afghanistan. This entry was posted in Translated Media-News from Ukraine and tagged Azerbaijan and Afghanistan, Cameroon, China, Côte d'Ivoire, countries of migration risk, Nigeria, Senegal, Syria, Vietnam on October 23, 2018 by oksana.